I thought I loved New York City to celebrate the holidays. It turns out that New York doesn’t hold a Christmas or Hanukkah candle to London’s festive celebrations. Fortunately for Americans, most holiday festivals are in full swing by Thanksgiving week, so it is a perfect excuse to ditch the turkey for warm scones and spend the week in England. I suggest you do the same before New Year’s Day when the city’s celebration concludes. 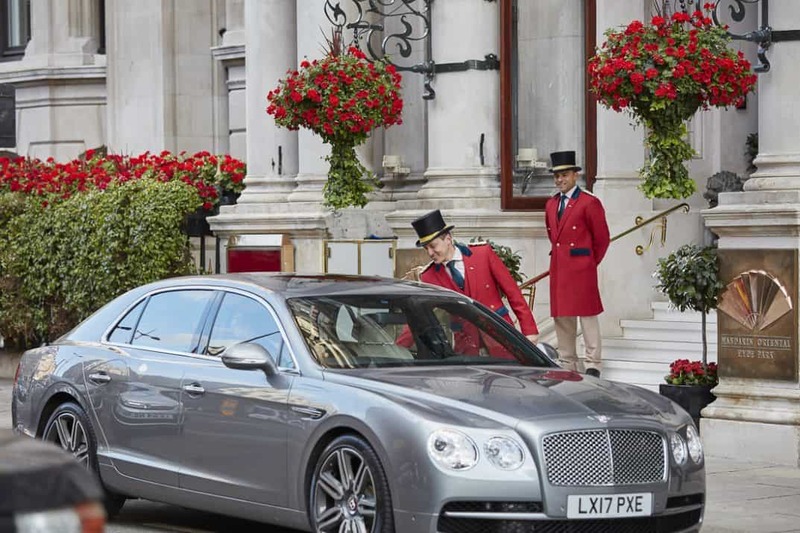 Located in Knightbridge near some of London’s best shopping, the Mandarin Oriental London is an obvious choice when visiting London for the holidays. We chose the Mandarin Oriental Hyde Park, London to put us right in the middle of the city’s best holiday events and shopping. I’d heard praises about this Knightsbridge property from friends since it opened in 2000, so I was so eager to check in. The Edwardian building opened as the Hyde Park Hotel in 1902 but was originally built at the end of the nineteenth century as an incredibly glamorous gentleman’s club. The front door of the hotel is on Knightsbridge road, but the original club, instead, maintained a Parkside entrance. This entrance has only been used by the royal family and other dignitaries once it became the Hyde Park Hotel. A convenient location is everything when traveling with children to preserve their energy for the planned activity and not the commute to it. 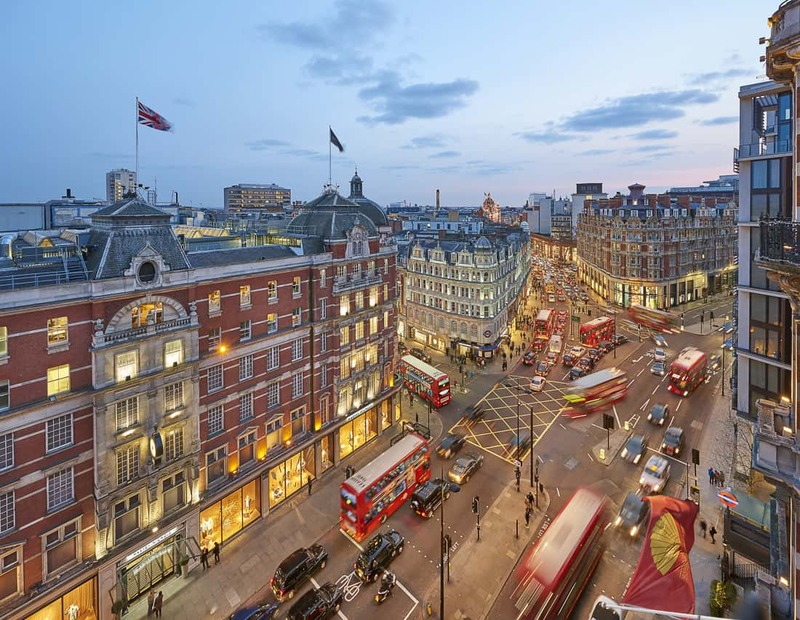 The Mandarin Oriental London is located across the street from Harvey Nichols, next door to Hyde Park and the Knightsbridge Tube station, and steps from Harrods. We could never begin to do all that was a quick walk or a short Tube ride away. 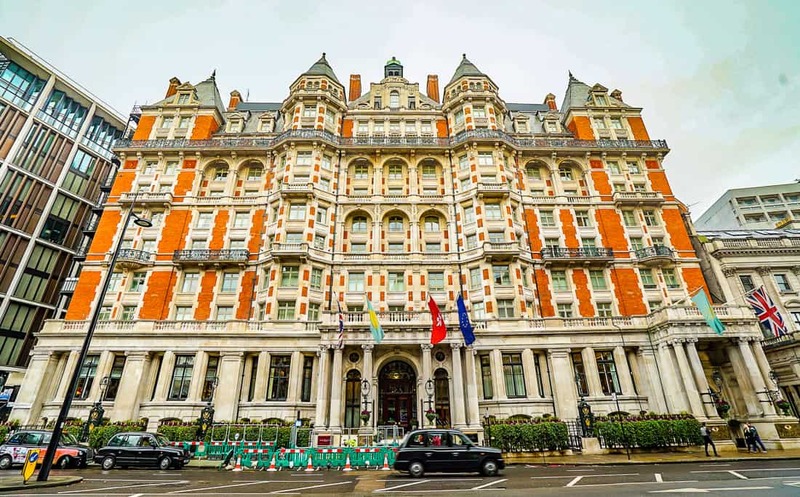 Although the Mandarin Oriental acquired the Hyde Park property in 1996 and opened in 2000, it inherited a very old-school European look that did not reflect the style most fans associate with the brand. The new renovation injects fresh modern design while retaining the original marble splendor of the lobby areas. 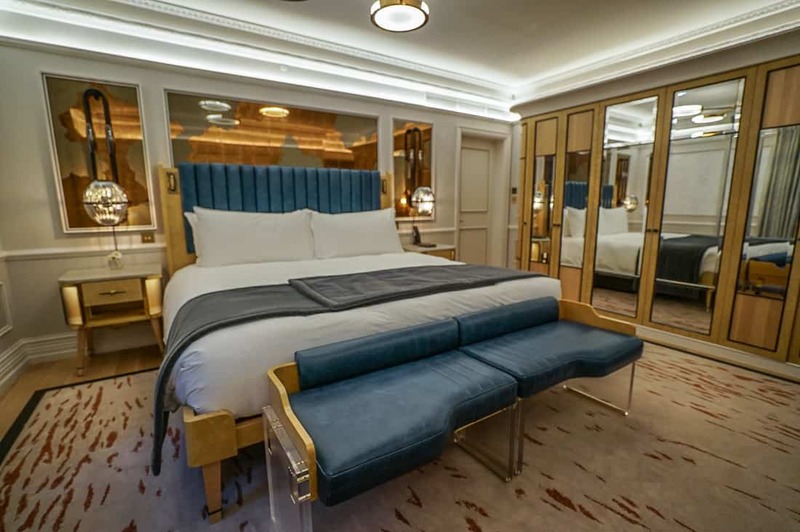 That’s all about to change because the interior renovations of the Mandarin Oriental have now been revealed, and they are spectacular. Though the complete renovation will conclude near the fall of 2018, the first phase opened for guests in Fall 2017. 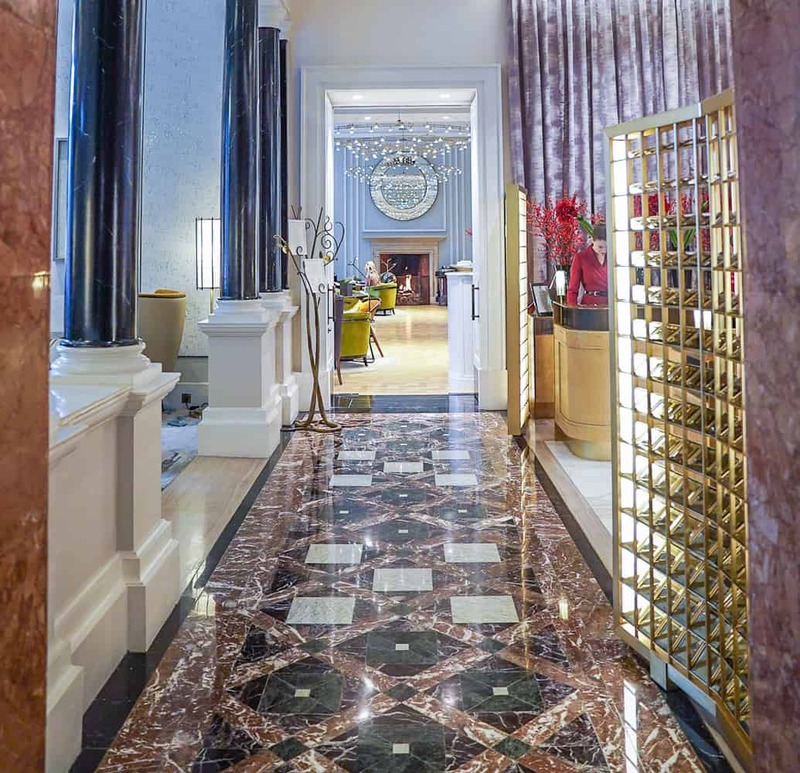 While its majestic marbled entry hall remains, the restaurants and hotel floors now offer the Mandarin Oriental look with subtle palettes of green and rose with restrained metallic highlights. Rosebery Lounge for tea and cocktails. 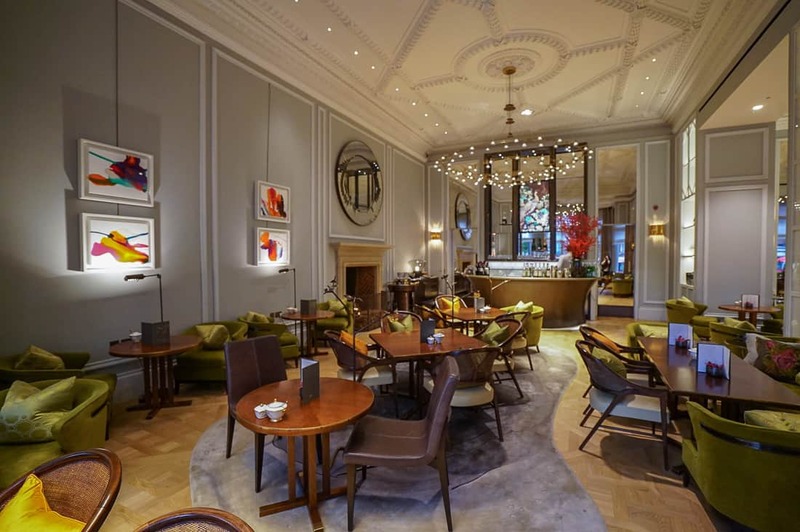 The property’s new chapter is the vision of Hong Kong based Joyce Wang who recently undertook the same task for the Landmark Mandarin Oriental Hotel. Throughout the renovation’s details, Ms. Wang took inspiration for the new design from the hotel’s neighbor, Hyde Park. She’s a mom and self-described nomad whose travels have shaped her work. It is very easy to get lost on her Instagram page. The hallways of varying shades of green make one think of Hyde Park on a perfect June day when Mary Poppins might land from the sky with her parasol. Ms. Wang’s results are both a nod to art deco while also introducing more modern elements, particularly in every light fixture. Her bedside fluted carriage sconces are a conversation starter on their own. And those signature pink chairs in each room are what you’ve been missing without even knowing it. 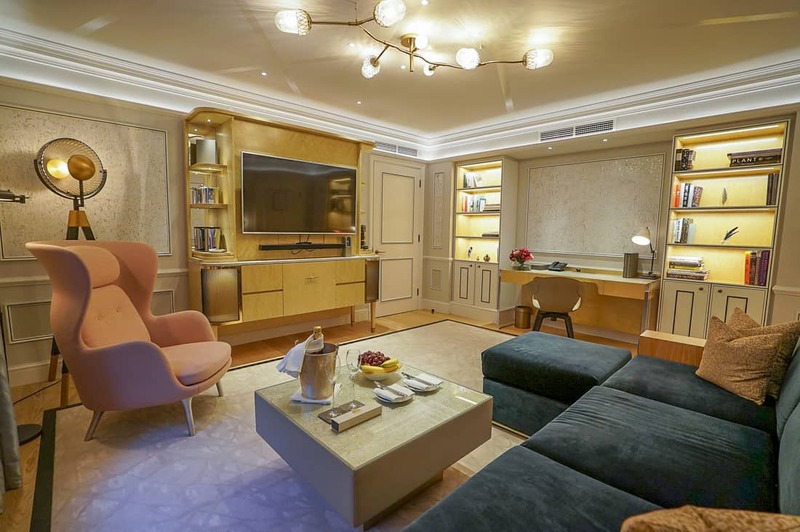 I previewed the new Turret Suites with beautiful views of Knightsbridge and saw where the two new Hyde Park facing penthouses were being built. The comfort and detail of these new rooms and suites are undoubtedly exceptional. I loved the recessed and dimmable lighting near the crown molding to give the rooms such a practical and glamorous feel. Newly refurbished suites are radically different than the hotel’s look before. The most delightful feature in our suite, for me, was its library. 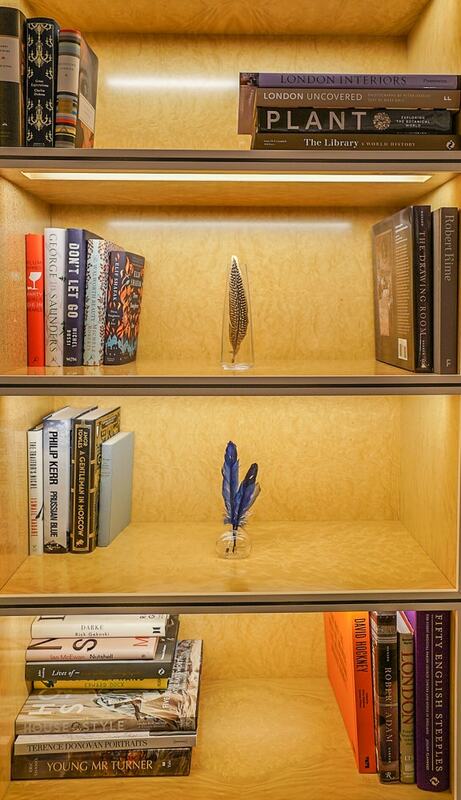 Heywood Hill’s curated libraries found in each suite’s bookcase. Heywood Hill is a Mayfair publisher who hand selected and curated the libraries of every room with bookshelves. You’ll notice this incredible detail right away, because these shelves were full of titles one actually wanted to read, from fun fiction by Plum Sykes to the most beautiful art books on London homes, antiques, and interior design. I now fantasize about returning for a week in a snowstorm just enjoy this incredible library that was in our suite, living off room service. The dominant feature in both the bedrooms and suite living rooms are the beautiful entertainment center, mini bar, and wardrobes. Discrete refrigerated drawers hold beverages. Giant high definition televisions with Samsung speaker bars underneath made movie watching festive after dinner. The bedrooms by Joyce Wang at the Mandarin Oriental London. 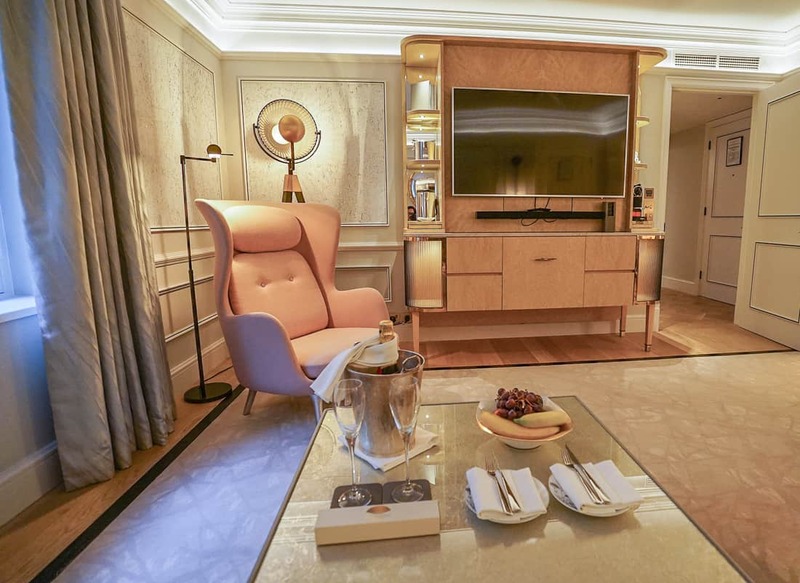 The Mandarin Oriental rooms are equipped with Smart TV’s that enable guests to connect their own media from their iPhones with the Airplay feature. This worked perfectly for us once I figured it out. My son was able to watch Paw Patrol through Netflix but was so confused when the pups spoke with a British accent. We were able to load one of the Harry Potter movies during a room service dinner, too, and loved this convenient feature. The suite’s pull out Prussian blue sofa revealed a double instead of a queen bed for my two children to share. Once I explained that my children would kick each other awake, the hotel had no problem delivering an additional rollaway bed for the living room. Everbody slept perfectly. The Prussian Blue sectional included a double sized sofa bed. Families should reserve the Mandarin rooms or suites in order find the space they need for rollaway beds. Pillow menus and abundant built-in power outlets with North American adapters in nightstands are other touches to make sleeping as luxurious and comfortable as possible. I think, as a brand, the Mandarin Oriental stocks bathroom amenities like no other. But the new bathrooms were truly special, filled with brilliant technology. My son ran out of the bathroom after checking in. “Mom, you have GOT to see this toilet.” This powered commode had a heated seat and bidet features. 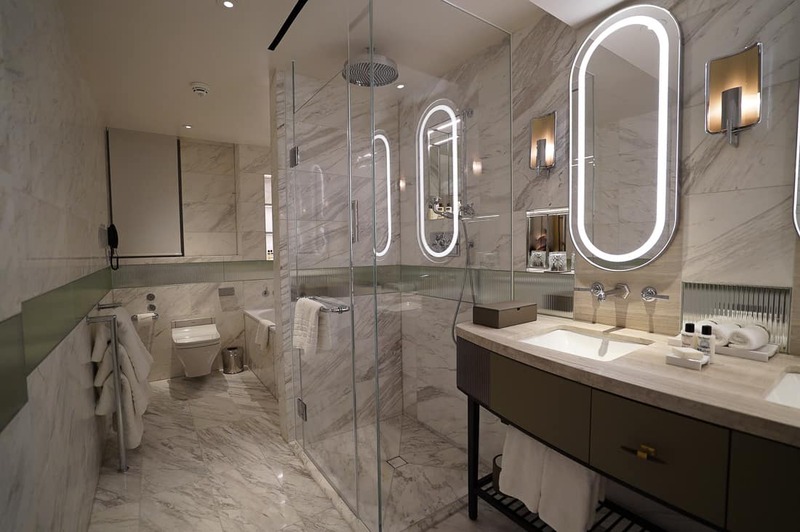 The most impressive feature, to me, was that if one entered a dark bathroom in the middle of the night, the rim of the toilet lit up to greet you before night lights switched on automatically. The bathrooms reveals some serious technology. The toiletry case on the double vanity held many things you may have forgotten such as shaving cream, tooth brushes, and mouthwash. Radiant heated floors and heated towel racks added more luxurious comfort. The Jo Hansford shampoo and conditioner with their divine citrus smell no thier way in my packed luggage. At turn down, room service delivered the most delightful tray for my children on our first night. They presented my kids with a welcome note, two Harrods Christmas teddy bears and some children’s bubble bath. Children are treated with welcome notes and gifts. Room service offered children’s menus (as did Bar Boulud downstairs). 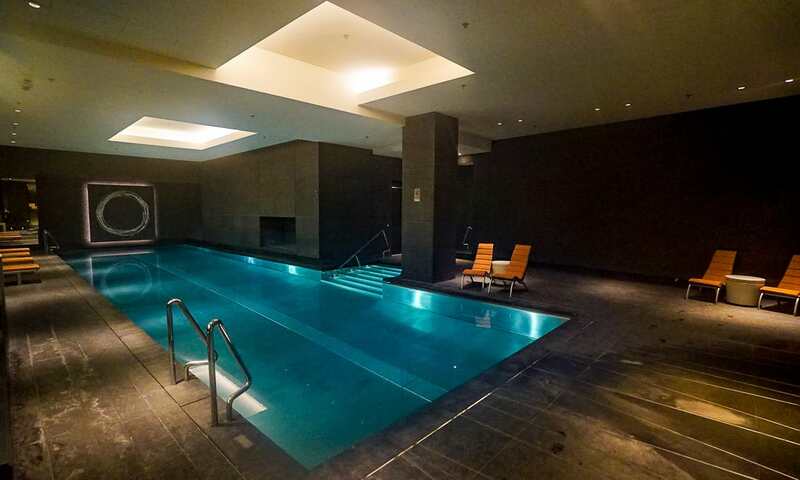 A fabulous family feature is the beautiful and serene spa pool in the basement. There are no restricted hours limiting children’s use either. The underground spa pool at the Mandarin Oriental London. 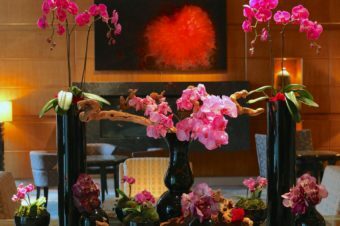 We’ve written about the Mandarin Oriental London Spa before, but all fans of the brand know they are serenity specialists. Compared to my most recent Mandarin Oriental spa visit in Miami the London location is on the intimate side. Designer Adam D. Tihany will undertake an expansion of the spa as the final stage of the hotel’s renovation. He designed the Mandarin Oriental Las Vegas as well as many new spaces at The Breakers in Palm Beach. Personal training is offered for those committed to staying in shape on the road. Our meals at the hotels restaurants were flawless in food quality and family friendliness. During the holiday shopping season, there’s a foodie haven for families waiting at Bar Boulud. 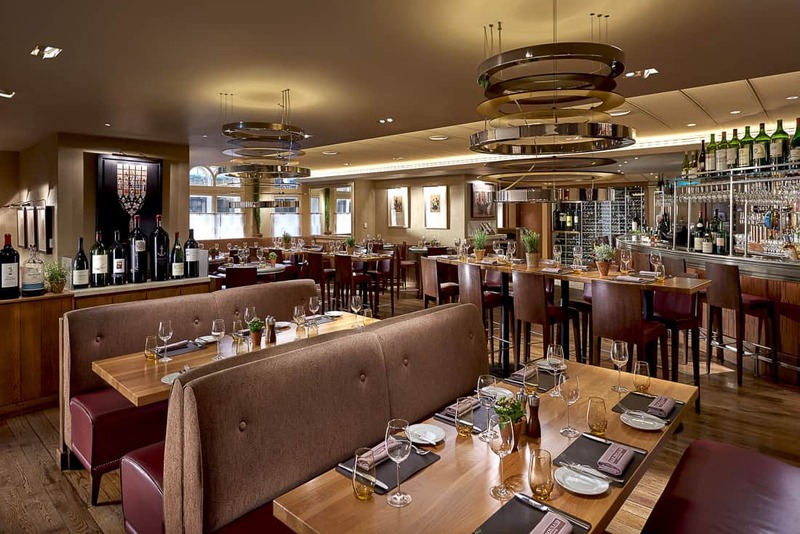 Bar Boulud serves a delicious family-friendly lunch and dinner of French bistro classics. 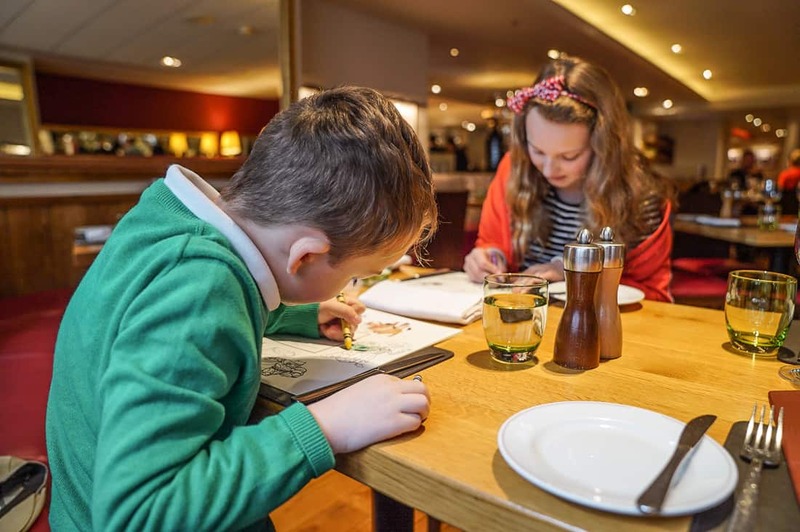 My children were given crayons, coloring sheets, and children’s menus and immediately went into a drawing trance that enabled us to enjoy reading the French bistro menu of Daniel Boulud. The cod in a white wine veloute at Bar Boulud. Americans who get tired of imitation burgers served in Europe will bite into these bistro burgers with sighs of satisfaction. 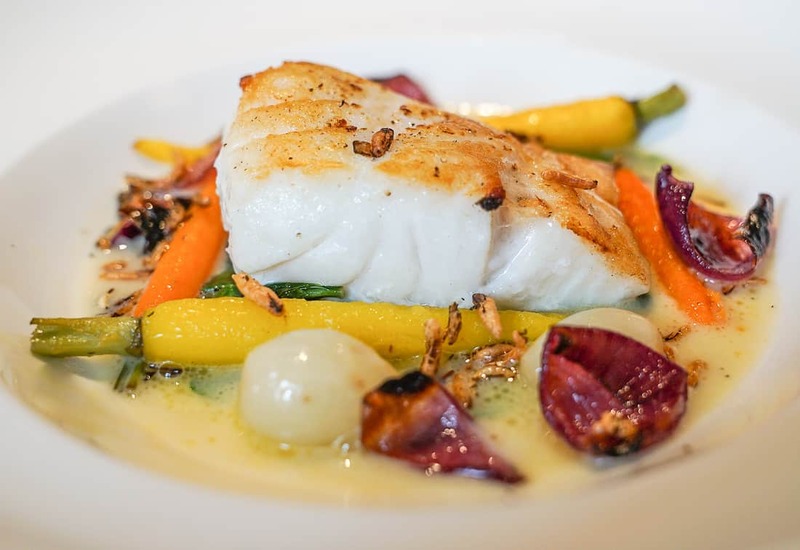 Our cod and stone bass fish entrées transported us to Paris. 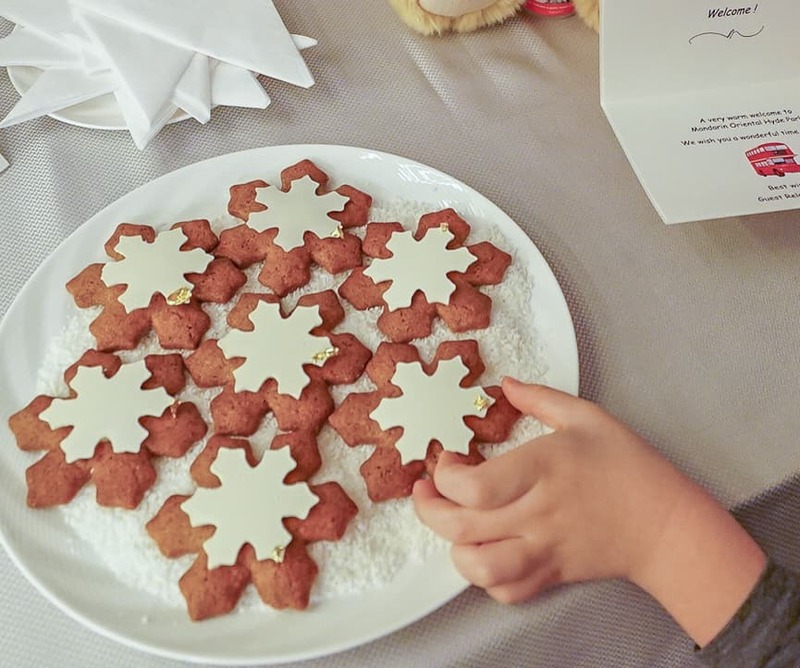 Bar Boulud always welcomes children and creates children’s menus for special holiday dining. 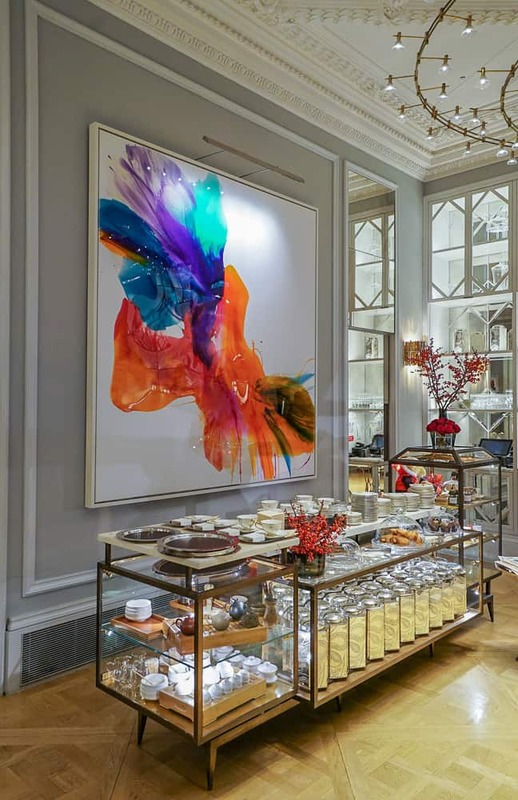 Rosebery Lounge serves casual luncheon and afternoon tea off of the lobby. We enjoyed a lunch while admiring the work of Orlanda Broom. Her brightly colored abstracts are hypnotic and bold, and I would catch myself staring at them as I ate my delicious tuna tartare tacos. 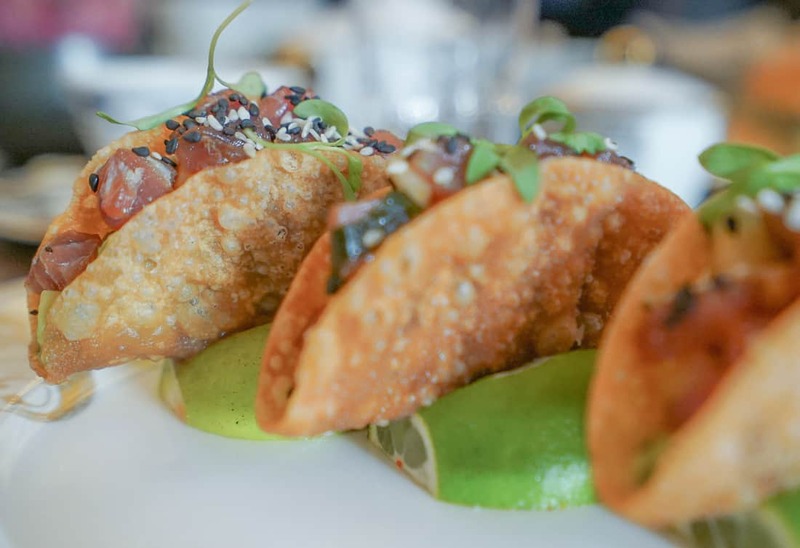 Tuna tartare tacos at the Rosebery Lounge. 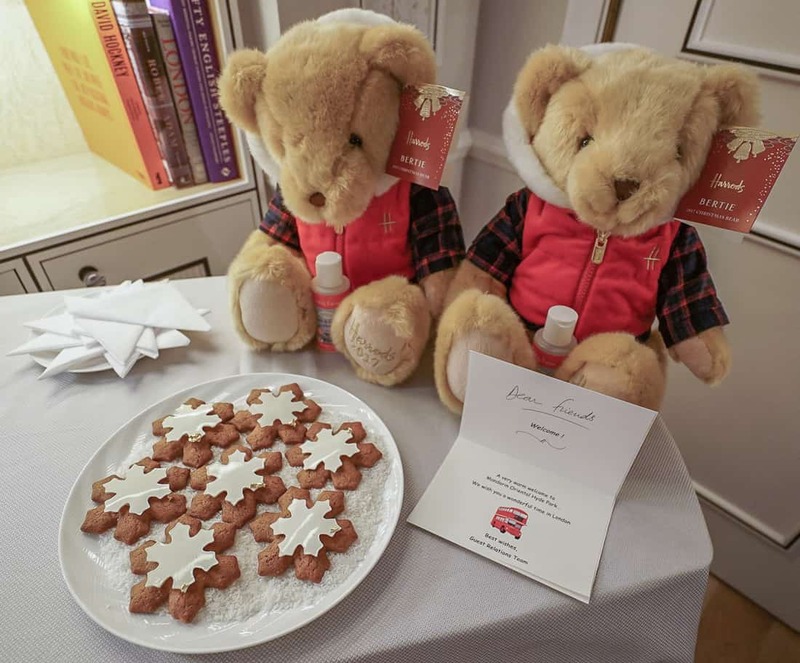 The Mandarin Oriental Hyde Park has partnered with Harrods to offer an adorable teddy bear tea featuring Harrods annual Christmas bear in the Rosebery Lounge. This year‘s bear, Bertie, who dons a Santa hooded brightly checked jacket, goes home with each child. It sounds the little touches that occurred throughout our stay that illustrated the Mandarin Oriental London guest experience as exemplary. After my children devoured the grapes and bananas from a welcome fruit bowl, staff replenished the grapes and bananas each day. 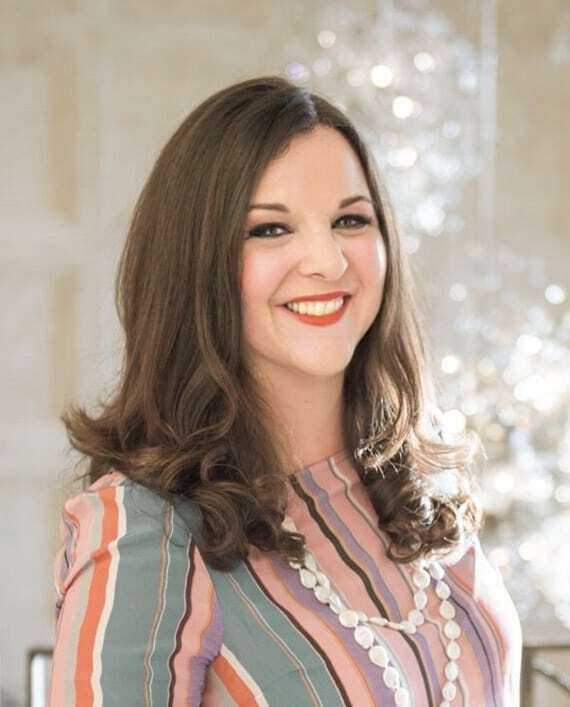 Housekeeping staff left both still and sparking water bottles from Blenheim Palace’s famed Oxford springs at turndown service. When room service staff delivered dinner to my daughter who was feeling unwell, they returned with grated ginger, honey, and special teas to help soothe her symptoms. When we were scheduled to leave on a 4 PM flight on our last day, François, the senior concierge, tracked us down in the hotel restaurant to inform us that our departure plans did not give us enough time to reach Gatwick Airport. We were in danger of missing our flight, as he had called to learn that all of the Gatwick Express trains from nearby Victoria Station were delayed. François jumped into action, notified the kitchen to quickly provide our entrées and insisted we take a taxi so that we wouldn’t miss our flight from the disruption at Victoria Station. 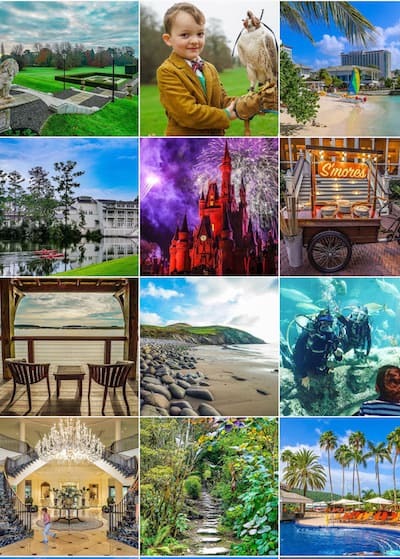 The hotel staff can maneuver all of your holiday details with an invisible, magical hand. No London Christmas season is complete without a visit to see Santa at Harrods Christmas Grotto. This family favorite fills up the moment the booking dates are released in September. Make sure you join the Harrods Rewards program as well as their family program so that you receive the email notices in August and September. Mark your calendar, pick up the phone and book an appointment at the Christmas Grotto. The Christmas Grotto is located off of Harrods Toy Kingdom on the third floor which will be fun for children to browse before or after. My children were fascinated by the scale model Harrods store made of Legos. The Godiva Café, located off of Harrods Christmas World, makes an easy afternoon of shopping and dining for families. Children who are usually impatient shoppers will find the visual stimulation of the massive holiday displays engaging. The Christmas World merchandise was a bit of a disappointment, as I was expecting it to compare with Bergdorf Goodman’s holiday and tabletop décor. Instead, there were too many stalls of Harrods souvenirs and branded ornaments. Hamley’s, the London toy store on Regent Street, also offers a meet Santa activity that is easier to get into, but still requires a reservation by October. Join the store’s newsletter to learn when to book. 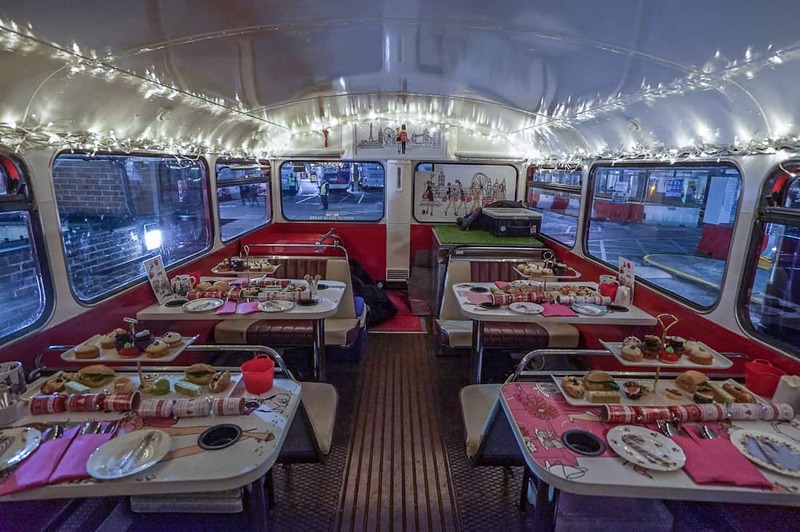 Winter Wonderland is a massive event taking up the easternmost third of Hyde Park. 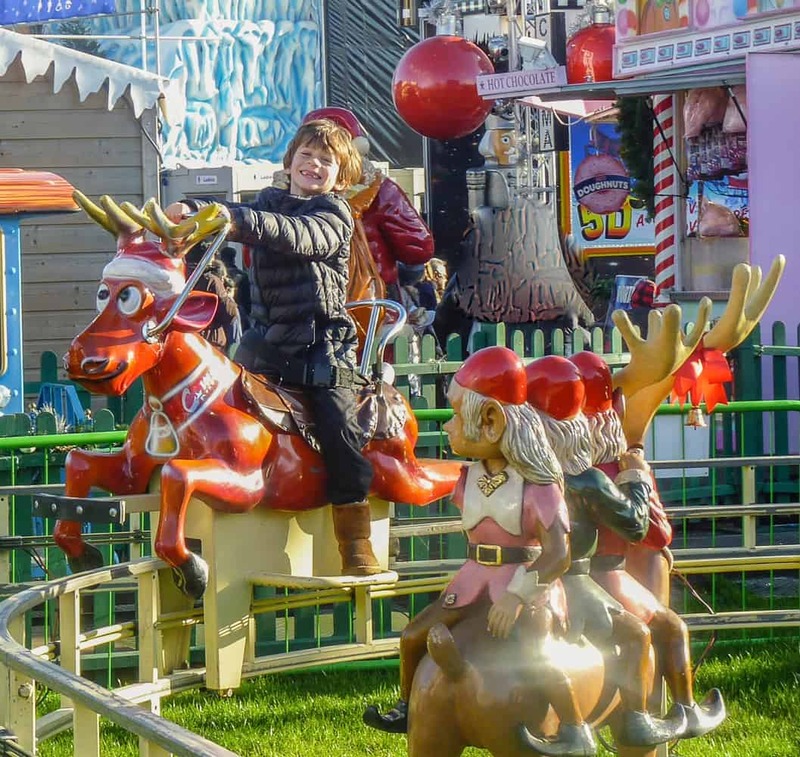 It contains several activities for families including a seasonal carnival with rides, special performances, an ice sculpture exhibit, and more. There’s a smaller version of the London Eye for which families can book their own car and reserve time for a premium price, too. The event draws huge crowds on weekends, and the nighttime environment can get a little boozy, so hitting this during the day and during the week is best for those who like tamer, smaller crowds. With most of London’s big city events, security is tightening, and large bags can slow you down at the entry process. Buses depart from Victoria Coach Station, and the tea’s spread was good, though not particularly geared for children. My six-year-old, who never met a carb he didn’t like, left many of the pastries on his tray. Gluten-free versions and glasses of champagne can be pre-ordered. The Double Decker Afternoon Tea by BB Bakery. I found the experience fun with two caveats. First, I wouldn’t repeat the evening tour because much of the drive is dark outside of the shopping streets that are lit. We would have been more engaged seeing London during daylight hours. And second, there is no toilet on the bus for the hour and a half tour. Despite our best pre-planning and requesting only a half a cup of tea for my son, he didn’t last. We had to exit the tour in the middle of Piccadilly with a potty emergency. After we found haven at Whole Foods, my son’s movements and facial expression caught the attention of the entire queue waiting in line, and he was invited to go to the front. 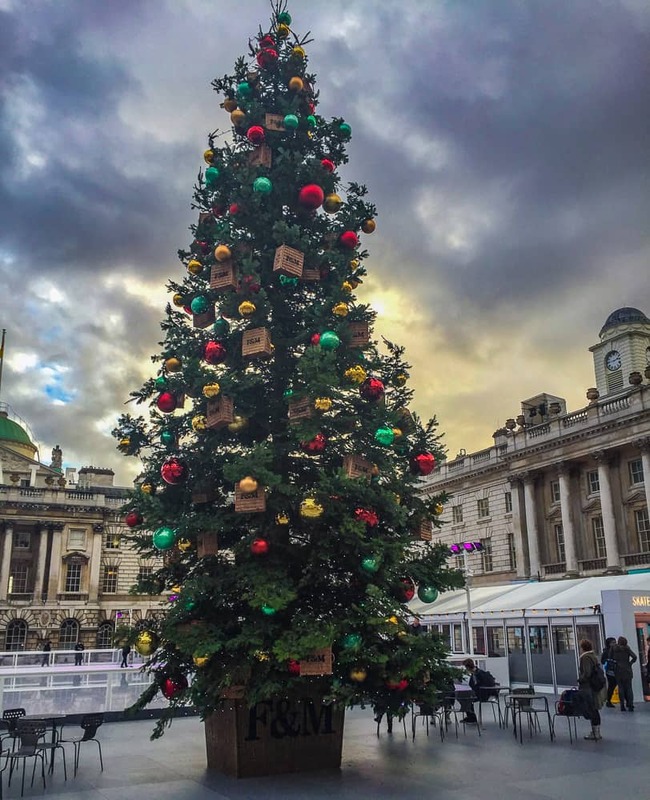 Somerset House is one of the more popular outdoor seasonal skating rinks. Fortnum & Mason provides a pop up Christmas shop showcasing thier Christmas hampers, post-skating treats, and cocktails. Families can purchase tickets in advance and look for Polar Club skating lessons for children during the day. At night, Somerset House brings in DJ’s to coordinate a more club-like experience to skate to contemporary music. An alternative is the skating rink outside the Victoria & Albert Museum located near the Science Museum for families to make a day of it. Although we were guests of the Mandarin Oriental London, these opinions are entirely my own.